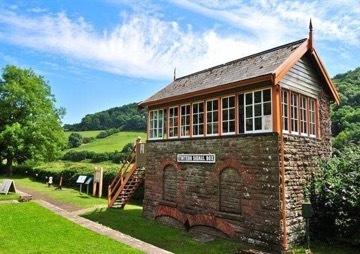 The award winning Old Station offers the best of what Monmouthshire can offer with a children's play area including a zip wire and is a great base for walks along the Wye Valley. The tea rooms offer a varied selection of food. The tea rooms are open on weekdays from 10.30am to 5.00pm from 1st April to 30th September and at weekends and during Welsh school holidays from 9.30am to 5.30pm. In October, they are open from 10.00am to 4.00pm. The site is situated in the Wye Valley Area of Outstanding Natural Beauty (AONB), 9km north of Chepstow on the A466 (S0 536 006). The site is owned and managed by Monmouthshire County Council Countryside Section and was opened as a Countryside Visitor Centre in 1975. The Old Station has developed an excellent reputation as one of the area’s top visitor centres and was voted the UK’s favourite park in the 2011 People’s Choice Green Flag Award public poll. The station has retained its Green flag status every year since. There are three railway carriages on site. Two new carriages arrived in early 2010 and these contain a souvenir and gift shop, a Destination Wye Valley exhibition area with information about the Heritage of the Wye Valley that will interest all the family, a tourist information point, and a meeting room. The third smaller carriage houses railway memorabilia and a work in progress scale model of the station from the 1930’s. Visitors can sit and relax and enjoy the wonderful scenery, wander along a relaxing one mile circular walk around the site passing along the riverbank, before visiting the Circle of Legends. 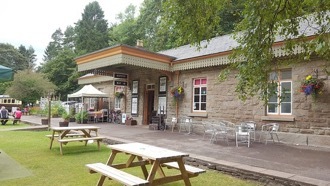 It is a perfect spot for a picnic or you can sample the traditional fayre from the Victorian station’s award-winning tea room (voted by Living magazine as one of the top 25 in the UK). Breakfast from 9.30am daily, a wide range of freshly baked cakes, superb strawberry cream teas(when in season) as well as home made soups and the famous Tintern platter are available. The tea room also caters for birthday parties, special occasions and pre-booked groups. For the younger visitors there is a full programme of activities, including miniature train rides, play area and wooden play train and plenty of open space to run and play in. From 2015 there is a new children’s play area and a zip wire. 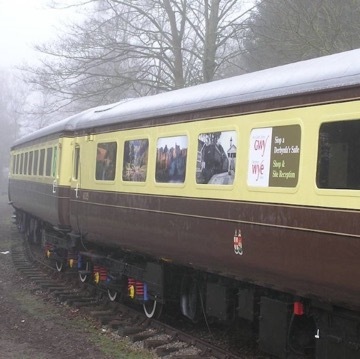 There is a meeting room which can be hired in one of the railway carriages and is suitable to seat up to 16 people. There is also a small campsite but advanced booking is essential. Site opens 1st April - 30th September, Weekdays 10.30am-5.00pm (tearoom 10.00am-5.00pm), Weekends 10.30am-5.30pm (tearoom 9.30am-5.30pm). During Welsh school holidays daily 10.30am-5.30pm (tearoom 9.30am-5.30pm). October 1st-31st open daily 10.00am-4.00pm. November 1st-1st March Closed. Although the tea rooms and carriage are closed the site remains open to the public. A charge is made for parking but entry to the site is free. The site is accessible for wheelchair users and an electric mobility scooter is available free of charge. Opening days and hours may vary for special events or during private bookings so please check by ringing for details.